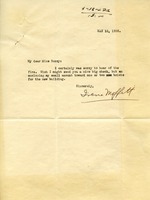 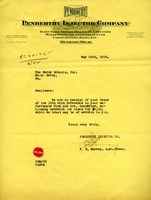 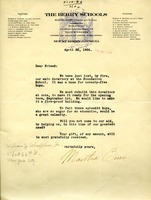 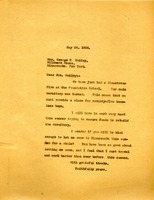 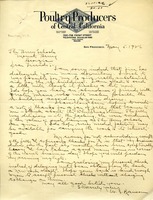 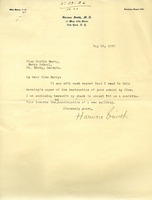 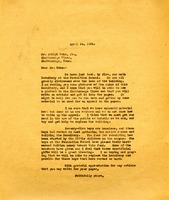 Letter to Martha Berry from Harmon Smith concerning the contribution to a fund for a new building that was destroyed by fire. 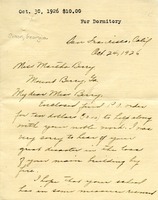 Grace H. Selkirk writes to Miss Berry to express her sorrow for the loss of the dormitory and sends $10 to help with the rebuilding. 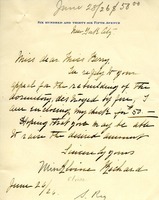 Elvine Richard sends $50 for the rebuilding of the burned dormitory. 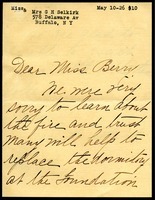 Mr. Samuel sends a donation of $10 to help rebuild the dormitory destroyed by the fire. 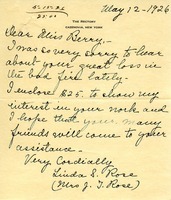 Rose contributes $25 following the fire. 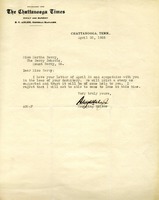 Miss Berry writes to Mr. Ochs about the dormitory lost to fire and asks for him to place them in the Chattanooga Times. 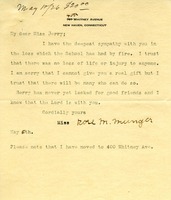 Donation of $20.00 from Rose M. Munger towards rebuilding after the fire.